Sunday: I was up at 7:00, why oh why oh why. But then I decided to use the time to write up this trip journal, so that was OK. We will have fun looking back and reading this. Cinnamon rolls for breakfast (family tradition). Nick started out the day by getting the left turn blinker fixed. 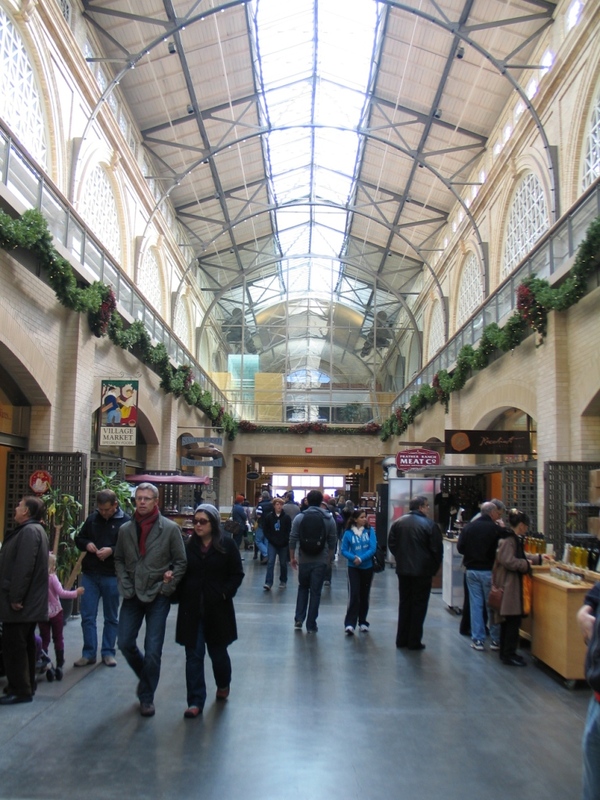 Then after much debate about which direction we should start our circular tour in, we were off to the Embarcadero, Pier 39, and Fisherman’s Wharf. When we got a few miles down the road, I discovered I didn’t have my Bruce the Shark finger puppet, even though I had talked about him and carried on about how I was bringing him and how he wanted to see the Pier. Nick was not willing to turn around and go home and get Bruce, go figure. I thought I must have dropped him when I went into our room to get my chapstick or something. If I dropped him in the living room, the cats were going to have something to amuse themselves with all day. Parked at about Pier 5, so we then walked backwards along our planned loop to the Ferry Building which has little shops, mostly food or food related. I got a Macaron (because we don’t seem to have any little bakeries that make those in Denver) and then came to Nirvana – Boccalone! I have seen this place on some Food Network show, just can’t remember which one. 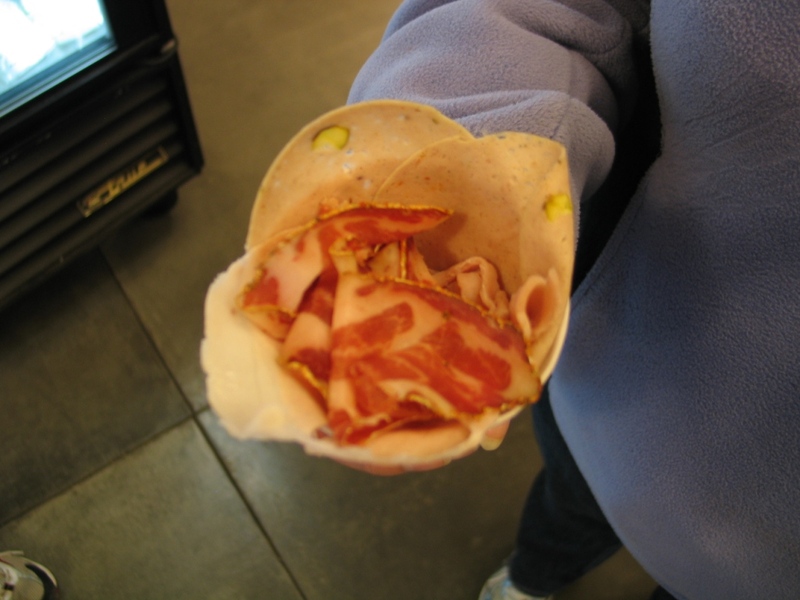 Anyway, they have a paper cone that they fill with “Tasty Salted Pig Parts” and it is fairly amazing. I quickly grabbed one and we all shared the bits of meat, nothing big, just a good appetizer for the day. I can’t believe that this place is the only location and we just stumbled across it. Was verrry tempted by their T-shirts. Bought some local olive oil as a “souvenir” – I like souvenirs that are either edible and then they are gone so you don’t have to dust later, or wearable. Was sorely tempted by another t-shirt at another meat shop that said “Praise the Lard” and had a picture of a pig. We started encountering street performers at this point: guys who do paintings with spray paint, and various shields and scrapers – the first one we saw was not using any sort of breathing filtration, I can’t imagine that is very good for you, with all the fumes. Various musicians, including on of the worst ones I have ever heard – he was singing in one “non-key” and playing guitar in a different “non-key”, he also had a harmonica holder, I kind of wanted to hear him fire up the harmonica and hear how he didn’t play that in any sort of normal fashion. Then there is a guy called Bushman, who essentially has two handfulls of bushy twigs taht are pretty tall, he crouches next to something so he looks like a bush, and then he jumps up and scares you. He got April pretty good because she was walking next to that side of the sidewalk. Does he expect to get tips for that???? Odd. And then guys who were being statues, all spray painted gold or silver. 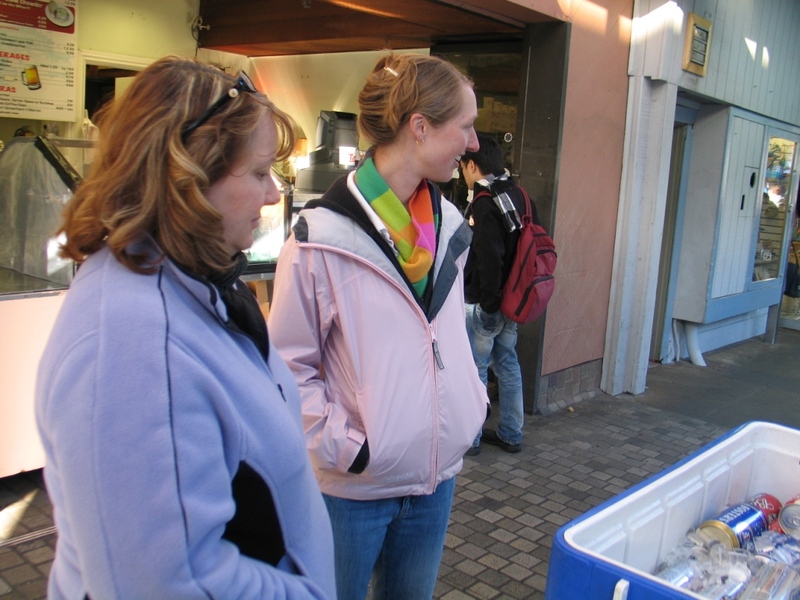 We did not take advantage of the opportunity to purchase churros from a vendor, they looked good though. 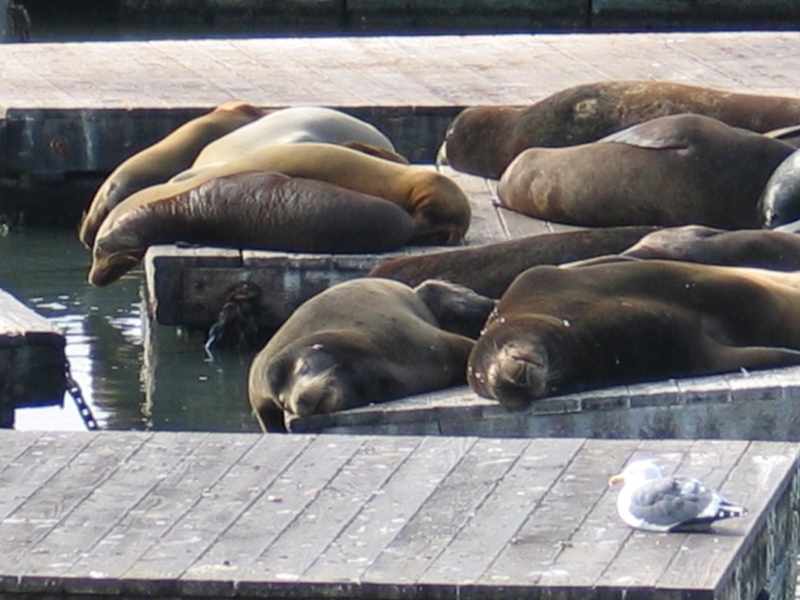 Then Pier 39 is where the sea lions hang out, and where there are a bunch of tourist shops. And – MINI-Donuts! Well, you don’t get to eat mini-donuts every day, so we had to have some of those. Mmmmmmmmm. Greasy burning hot goodness. It is sad, some of these shops make the stuff like corn dogs and even funnel cakes in advance, so they sit around and get non-crispy. That is the POINT of this stuff, people. Anyway, the mini donuts were nice and fresh. And then we sat and watched the sea lions for a while. They weren’t very active but it was relaxing to watch them lollygag in the sun and relax, so we could relax for a bit. Walking on the pavement is harder than walking on beaches. The highlight of the sea lion watching was when a little kid swiped my soda. I turned around to look for it, and his mom saw him about the same time I did. “Reuben, that’s not yours!” That was rather amusing. He didn’t into it, although just about, I am sure diet is not his preference anyway. There were not that many sea lions, April and Nick say in the summer there are many more, and they were being quiet. There was a little boy there making sea lion noises at them, but he wasn’t being really loud about it. Ken knew that I could do REALLY LOUD sea lion noises, but I wasn'[t willing to do it unless people would give me tips like the street performers. Plus I thought the wildlife preservation guy who was running around there might give me a lecture for bothering the sea lions. Walked back around the tourist shops, purchasing a Golden Gate bridge magnet, and an accordian magnet for my mom, and finding a place that was going out of busines, and getting a half price sweatshirt. 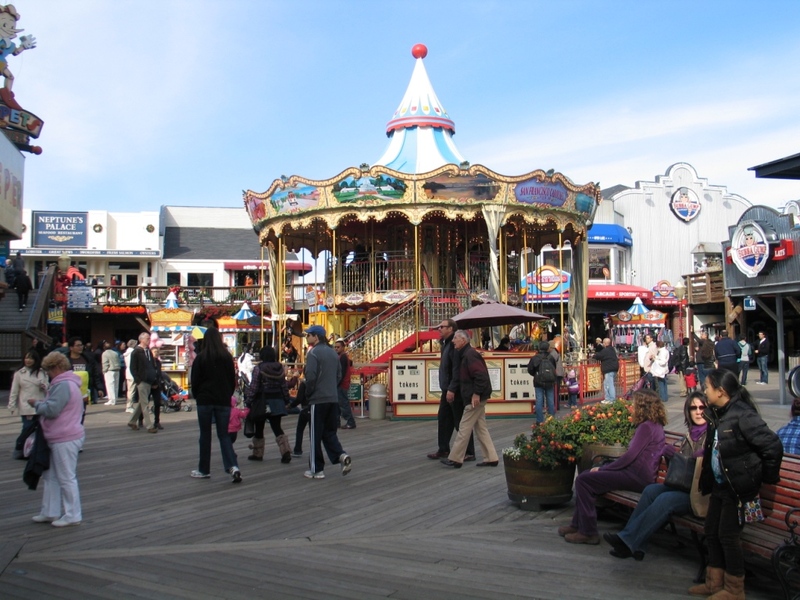 Then we headed for the Fisherman’s Wharf area. One of the big things is the Boudin Bakery (now, Boudin is a spicy Cajun sausage with rice, and I didn’t see any of that around, so that was disappointing) but they are famous for their sourdough and sourdough bread bowls. They have a big window where you can watch their bakers, and sometimes they are making the bread loaves into animal shapes, well they weren’t doing that while we were there, they were makingh jalapeno cheddar bread, that looked pretty darn good to me, I may have to try to make some of that. We went through the quick bakery line and April had a grilled cheese sandwich, Nick had a bread bowl with clam chowder, Kenny had a sourdough pepperoni pizza, and I had clam chowder in the bread bowl. The bread bowl was great but that clam chowder had about half a clam in it, if that. April and I looked around the store a little bit before we all ventured outside to the super scary public bathrooms. They were not nearly as bad as the one at Golden Gate park. Next: Museum Mechanique- this is a collection of old-time arcade machines, some of them REALLY old – the man who collects them had been doing it for a long time. There are several have little vignettes of things like hangings and guillitines, many music boxes of various types, and some actual games – Nick did the boxing game, where you have to give the punching bag your hardest punch. He was trying for the longest time to figure out how to get the punching bag to come down on it after you put the money in, when April pointed out the “Start” button is up above your head, and he pushed it, and pretty much got hit in the face by the punching bag coming down, so that machine CAN fight back. We spent some time wandering around looking at all of the old gadgets, and then crammed all 4 of us into one of the photo booths for a picture strip, which turned out greatly entertaining, of course. 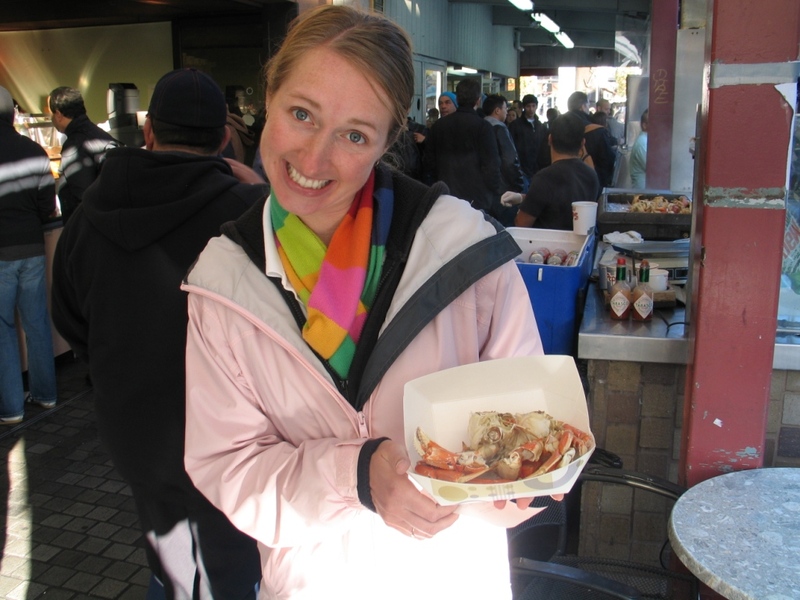 Before we left the Fisherman’s Wharf area, I wanted to have crab and Nick wanted to have crab, so we found what we thought would be the best place, that Nick had scoped out earlier. 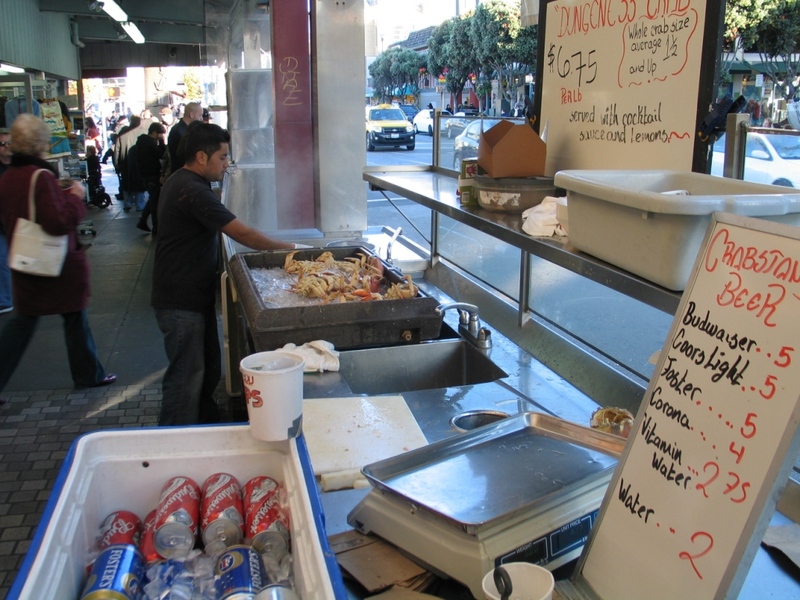 They have crabs there ready to go, steamed already, and when you order one, they re-heat it by plunging it in and out of the boiling water bath, and they make all the cracks for you, so you don’t have to deal with crab crackers, and the meat is easy to get to. April and I wait for the crab. 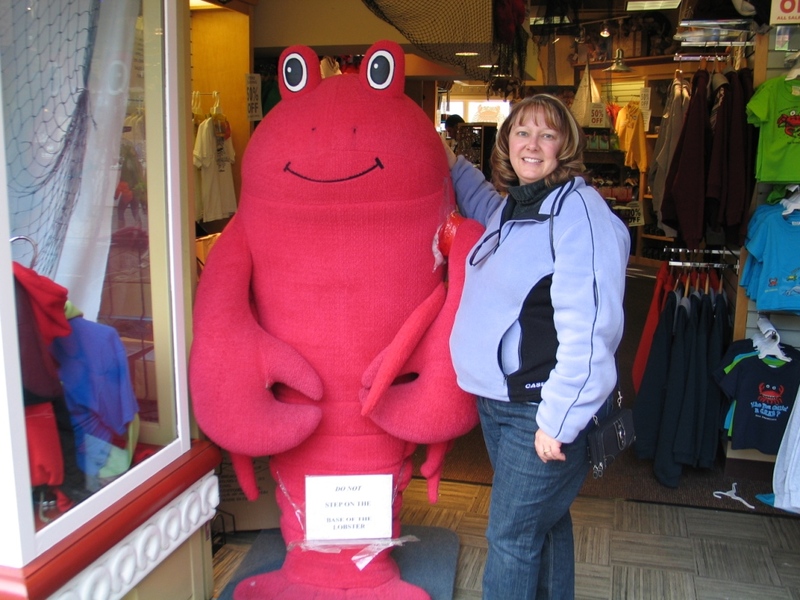 Look at the cute crab! 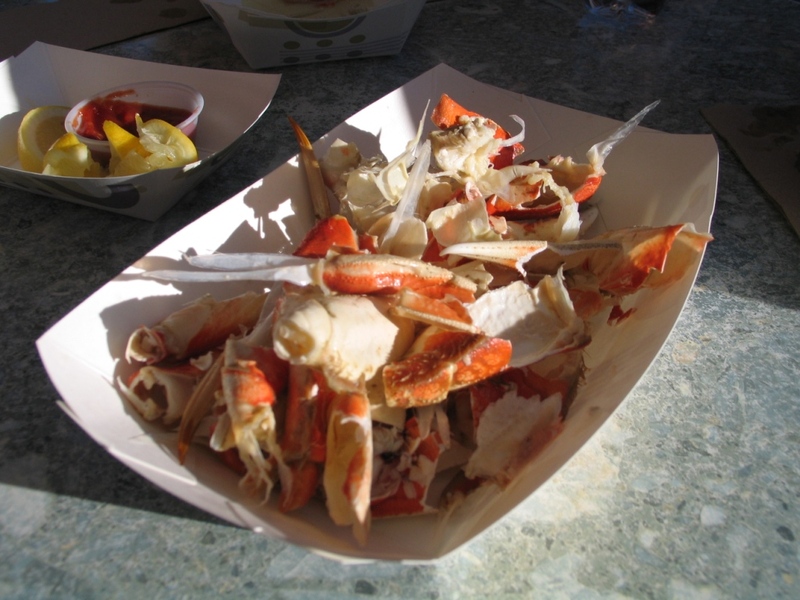 Look at the delicious crab! 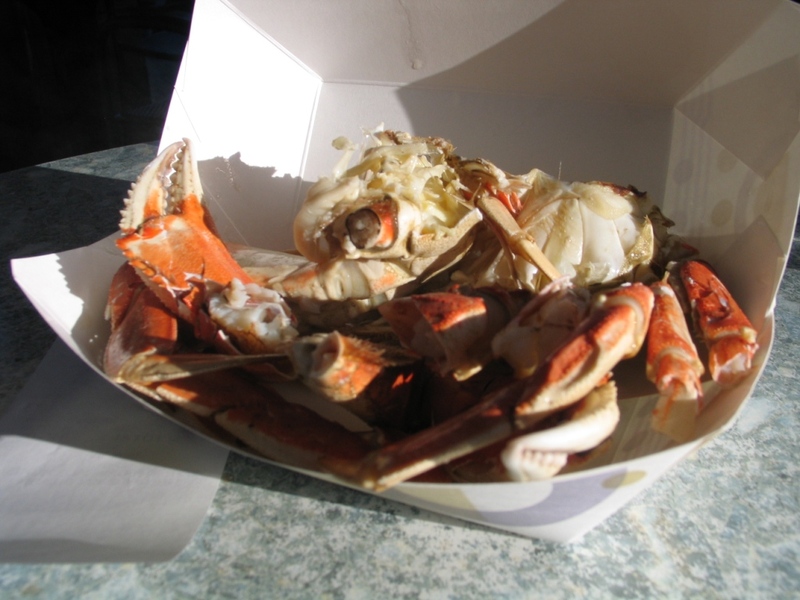 We all shared it, figuring that was a good way to do it without getting too full of crab. Kenny even tried a couple of little pieces, declaring that it was “Ok.” Of course you end up with crab under your fingernails, and then you think about all of those machines you touched at the Museum Mechanique, and how you are now eating with your hands…….but it was delicious nonetheless. Need to remember the packet of hand sanitizer wipes next time. There were plenty of little shops all along here but I had my magnet and my sweatshirt so I was quite happy with those as souvenirs. 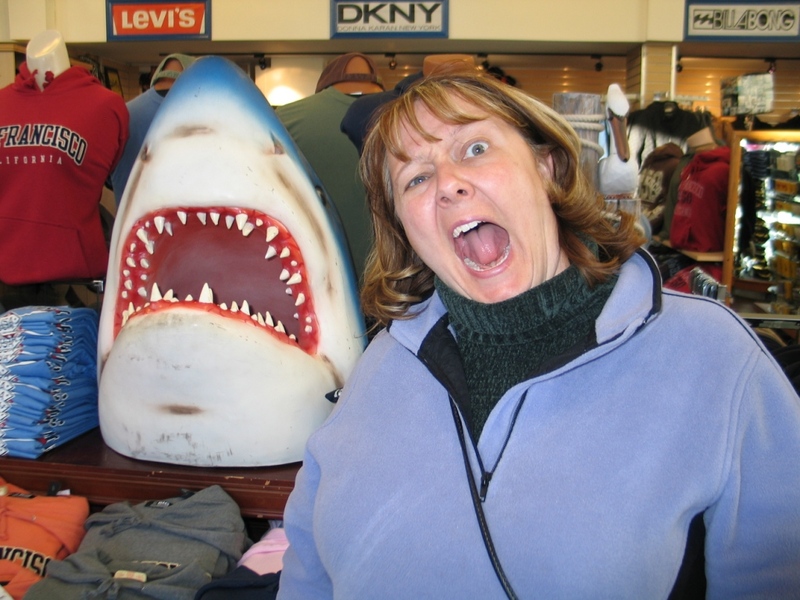 The shark was, unfortunately, not for sale. This is one of my favorite pictures of me EVER. So then we trekked up the hill to Ghiriradelli chocolate factory. They have quite a complex there – but apparently no factory tours yet. 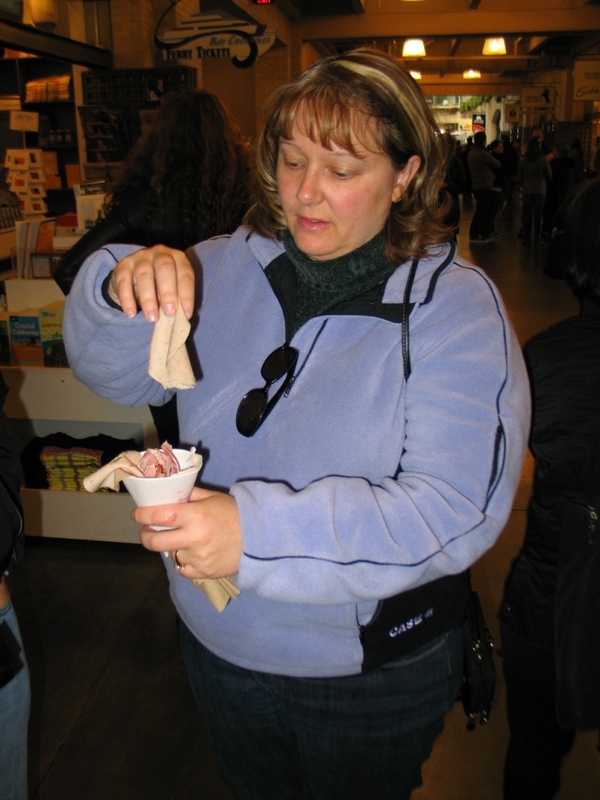 In one of their shops they are usually handing out samples of their chocolate squares – April and I got ones that were Peppermint Bark on top, chocolate on the bottom, those were good. Then to the Soda Fountain- we decided to share again so we could have ice cream but not totally fill up (not that we weren’t still moderately full from lunch and then from crab….) so we had a Cable Car Sundae, which had chocolate ice cream, Rocky Road ice cream, and chocolate chip ice cream, marshmallow sauce, hot fudge sauce, caramel sauce, and whipped cream, oh my was that good. Then back down the hill to the line for the cable car. We had to ride on the cable car if we were in San Francisco. The line was HUGE, and there was a street musician standing there “entertaining” all of us while we waited. He had an electric guitar, speaker, and microphone all set up. He was not really greeted by much more than apathy from the crowd. Perhaps because he had some serious pitch issues and also pretty much sang every song at the same tempo, which was basically too fast. I was trying to make some money on my own by seeing how much $$ April, Nick or Ken would give me if I caught one of the many pigeons that were wandering around, but they weren’t going for it. I told them that would be real performance art….We were near a swimming club, and there were people out in the ocean swimming, which is just insane, because it was COLD – April and Nick say it never does get super hot here in the summer, so it isn’t really a beachy place. But then again it doesn’t get super cold in the winter, which is a good thing, because there are all these incredibly steep hills, and there is no way you could drive on them with snow. So we (eventually) rode the cable car up the steep hills and past Lombard street again, and hopped off in Chinatown. I was hoping to find a glow in the dark Buddha to go along with my glow in the dark Lady of Guadalupe but apparently glow in the dark Buddhas are not an item that is in big demand. Will have to search the internets. Wandered around the many mysterious food shops, which were doing quite a good business in various produce and fresh fish, etc. Walked back down Broadway and we had made a big circle for the day and were back to our car. Headed back to Nick and April’s and sprawled on the couches while we debated going out for Chinese or eating Thanksgiving leftovers. I decided I was in the mood for Chinese food since we were just in Chinatown, so we did that (Kirin’s, in Berkeley) – had the most amazing jasmine tea I have ever had, and excellent wonton soup- usually wonton is in a clear broth, and this was in a really rich beefy broth, it was incredible. Then they promptly brought our orders, but totally NOT what I had ordered, so after I dug in, I was like – hmmm, this does not seem to be soup, it does have noodles, but no scallops, oysters or shrimp….so that was switched and then I had a huge bowl of soup in about 5 minutes – of course, waaaay too huge for me to finish at that point, but all the seafood was tasty and the scallops were incredible. Ken had broccoli beef, Nick had red pepper chicken which was very tasty, and April had Cashew mushroom chicken. It was all good but I would most recommend the wonton soup. Then we came home and played progressive rummy – this does take a while to get all of the rounds in, so it was kind of like playing drunk by the later hands….I was getting a little loopy and tired. And April pretty much whipped us all soundly in that, I ended up with the high score (I think this is two games in a row where that has happened now) and I was ready for bed after that. We all spent a significant amount of time looking for Bruce the shark, everywhere the cats hide their toys, under the bed, in the refrigerator, in the garbage, on the lawn, etc., but he has not been found. I am hoping he comes to light when we pack. This entry was posted in San Francisco Trip Report 2010, Travel and tagged Aurora restaurant reviews, Chinese food, crab, donuts, Embarcadero, Food, macaron, pork, San Francisco travel by glenderella. Bookmark the permalink.